Welcome to a brand new weekly feature from Rob Zombie. Every week RZ will open up the vaults that are his record collection and share these with his fans, including his views on the album and more. “To start things off I figured I would pick the absolute first album I ever bought with my own hard earned cash and by “hard earned cash” I mean it was most likely birthday money or something. The time was 1974, I was about nine years old and ready to rock. Elton was of course already a world-wide superstar and I was a huge fan from listening to him on FM radio… but now… now it was time to make the move to vinyl! 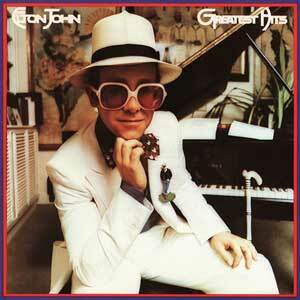 So, playing it safe I picked up the amazing ELTON JOHN’S GREATEST HITS. Back then greatest hits records were always the way I started my journey into an artist work. I figured start with the hits and work your way backwards. Anyway, it goes without saying that every single song on this record is a modern classic and I don’t have to waste your time telling you about “in my opinion Elton is one of the greatest songwriters of all time, bla, bla, bla”… but if for some strange reason you don’t know anything about Elton John… then go get this record. From “Rocket Man” to ” Bennie And The Jets” to “Levon” it is a killer disc all the way. ← Rob Zombie on next album: ‘Definitely our best record yet’.